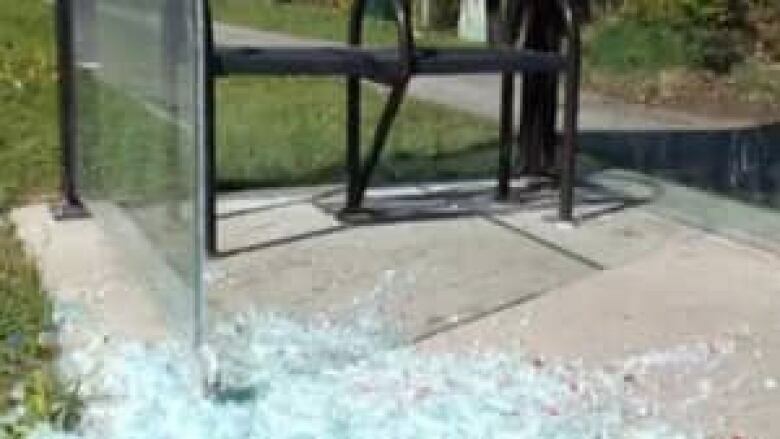 Vandals smashing glass and damaging other parts of OC Transpo bus shelters cost the City of Ottawa $225,000 last year, but the city said it has no plans to switch to plexiglass or another more durable material. Last week, three bus shelters along Blohm Drive were smashed in the south end neighbourhood of Hunt Club Park. Residents expressed disgust at the vandalism and said the event was all too common in the area. "No one knows who they are, maybe they're older teenage kids but they should be held accountable," said resident Dorothy Murray. "Our taxes are going up and so do our bus fares." It isn't an isolated incident: the city said they responded to 368 requests to repair bus shelters in 2011. There are about 1,400 bus shelters in the city. Of those requests, 207 were to fix or clean up shattered glass. It costs $350 to replace one pane of glass. In 2011 the city spent $225,000 for all bus shelters repairs and another $135,000 to clean up graffiti at the stops. The glass that encases the bus shelters is the industry standard, and though it can be shattered by excessive force, OC Transpo found in a comparitive study that it was superior to plastic. "Plexiglass fades over time, it's not as tranparent, it can be melted ,scratched … a lot of things," said councillor and transit commission head Diane Deans. "Glass is transparent, is scratch resistent, it's still safest for citizens and transit users." Damage to shelters usually happens overnight and perpetrators are rarely caught. Deans said the city can't afford to put surveillance cameras on its shelters, and instead said citizens need to step up and report suspicious activity. "It's about being eyes and hears of neighborhood," said Deans. "If you see suspicious activity report it to the authorities. If it's not reported we won't catch the culprits and ultimately that cost shows up on the tax bill."